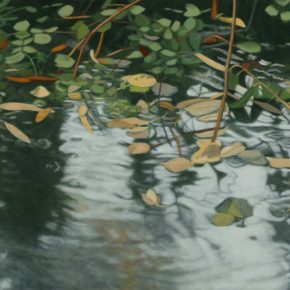 Waterscapes by Connie Borup opening January 17th at Salt Lake City’s Phillips Gallery once again demonstrates the power of resurrection. Not just the renewal of nature, but the regenerating endurance of Borup’s idiom. Working in oils on medium-sized canvases, Borup continues to explore nature, and how little we really know about it. Not only are we treated to numerous paeans in the finest of details, but are constantly reminded of how many visual surprises are hidden in the most unsuspecting of places. At the heart of Borup’s work lies a fascination with natural process and the cycles of nature: the yin and yang of life. Rich with pathetic fallacy, the works show us a world of tumult and repose, brutality and recovery. Exemplary is ‘Water Journey’, which shows a gently sloping beach, half bathed in water. 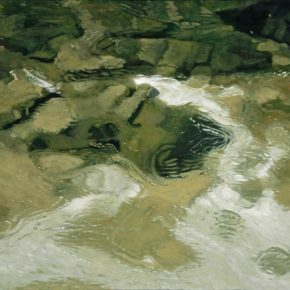 The fluid is completely transparent, giving us a direct view to the riverbed and its mottled lodgers. These consist of an assortment of smooth and rounded pebbles that are strewn across the waterbed, landing in chance positions like dice on a gameboard. The ovoid forms are contrasted by several sharp twigs, which jut into the scene at odd angles, adding agitation where once there was none. 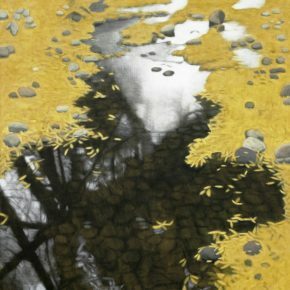 ‘Watery Resting Place’ presents a similar scenario as the tangled branches of an overflowing shrub pour out over a waterway and drop their leaves onto the water’s surface. As they drift along, some float away while others stay and idle, perhaps as a parable to the unpredictability of life. Not only does this foliage guard darker recesses of the underbrush, but serves as a harbinger of color, in creamy beiges and greens. In addition, leaf shapes lose their depth, becoming elliptical and lacrymal to evoke Japanese screens. Whereas some of Borup’s works use water as a window onto subterranean worlds, it here serves to reflect a gloomy, overcast sky. Borup’s images are often situated at transitional locations, where water meets land and adaptation is required. In particular, the artist’s iconography feeds off expired plant life and the resulting decay: the retreat of leaf color and the draining of pigment. Here, stems and branches become splintered and prickly, yet are swiftly remedied by the healing properties of water as the source of all life. In these instances, the harsher effects of nature are mitigated by the interplay of light and water and its dual role as window and mirror. Such is the case in ‘Dancing Reeds’, where a hillside of reeds has been ravaged by a long, dry summer. All of the plants have expired, their leaves bent in cruel contortions, forming peach and cream arches. In the foreground, a still blue pool reflects the plants, translating their curved leaves into jagged, lyrical patterns. The pool’s pale blue and gray hues contrast the warm brick colors of the red rock background. A cluster of plants emerge from the middle of this puddle, showing a Nietzschean perseverance in the fine green sprigs sprouting from their base. A similar resoluteness is seen in ‘Glassy Echoes’, where a dried bush defies gravity by growing horizontally above a body of water. Hovering just inches above the surface, the bush makes us marvel at the architectural tenacity of its achievement. Most of the curved branches grow skyward, while a few are downturned, stroking the water like fingers. Bleached by the weather and drained of all pigment, most are chalky white, while a warmer orange hue clings to a few remaining sticks. These weave their way in and out of the lighter twigs, forming a lattice through which the blue-grey water can be seen. While the actual branches possess a gently curving shape, they adopt a more irregular motif in their reflection. Here I can’t help thinking that the interplay of water, wind and wood not only mirrors our own existential predicaments, but at times, the folly of human endeavor in general. 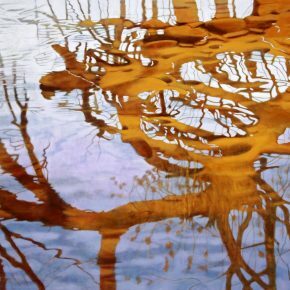 Perhaps the most dramatic of this series is ‘Tree Reflection’, where the view is limited exclusively to a reflection. Pictured is a tree of uncertain origin, with branches twisted into the paths of Rorschach inks, inviting prophetic interpretations. Forming an intricate lace not unlike a splatter painting, this is set against the ripples of a small periwinkle pool. Saturating our vision, Borup has chosen a fiery palette of crimson reds and oranges for the tree’s reflection. This conjures up sun flares, and the violent alchemy that set the landscapes of Southern Utah in motion. As we experience the tree in reflection form only, we are left to speculate on the original object that inspired this doppelgänger. As such, the work invites parallels with other reflecting pools, and their capacity to misrepresent and deceive. Cautionary tales which expound on the illusory nature of life, such as Plato’s Cave, also come to mind. More reassuring is the use of the mirror by Perseus, which functioned as an aid to overcome demons. Just as we think we have Borup pegged, ‘Pond Disguised by Leaves’ sends our thoughts into new directions. 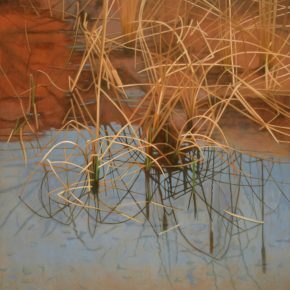 In this work, water plays a dual role of mirror and window, while incorporating new elements of the environment. Here we see a shallow pond, bordered by two masses of tiny, lanceolate leaves. These flank the water, like golden curtains on either side of a stage. The water inside is still and reflective — like a sheet of glass. In its mirror, a bright gray sky is captured. This is contrasted with the dark silhouette of a nearby tree. Where the shadow falls, a view to the pond bottom is seen, carpeted with pebbles and sludge. Still and cold, this is the birthplace of northern mythology, where Ophelia was laid to rest, and where the Lady of the Lake retreats. Works such as these not only remind us of the nuances and complexities that can be found in the most unassuming of nooks and crannies; more importantly, they expand the parameters of Utah landscape painting which, subject to market forces, often descends into cliché. Replete with mirages and shadows, mirrors and windows, screens and symbols, Borup’s works reveal secret worlds — both real and imagined — that inspire a renewed return to nature — and art. 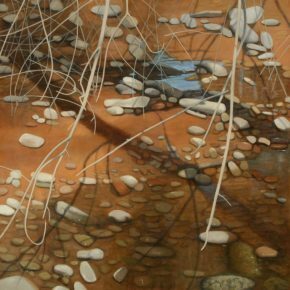 Waterscapes by Connie Borup opens at Salt Lake City’s Phillips Gallery on January 17, during the January Gallery Stroll, and continues through February 14. This review appeared in the January 2014 edition of 15 Bytes. Alexandra Karl did a BFA in Ottawa (Canada) and then spent ten years studying art history in Europe. She worked at Munich’s Lenbachhaus for five years while completing her Masters, and received her PhD in the History of Art from Cambridge. She has taught at the U, the McGillis School and Congregation Kol Ami. She has led tours to the Spiral Jetty and Frank Lloyd Wright’s Stromquist House. She believes a vigorous art scene is essential to any thriving society. Congratulations on the show Connie, I’ve been a fan of your work for a long time!